It’s about 200 air miles southwest of Anchorage and roughly 230 river miles from Bristol Bay, on state-owned land that was set aside in part for its mineral potential. Like a lot of Alaska, you can’t get there by car — you have to catch an air taxi to Iliamna Airport, then a helicopter to the site itself. The Deposit itself is located at about 1,000 ft above sea level, on a terrain of rolling, scrub-covered hills. The broader area ranges from mountainous (Groundhog Mountain) to alpine tundra to marshy lowlands. There aren’t many trees. A succession of glaciers carved into the landscape, leaving small lakes and ponds in their wake. The Deposit is near Sharp Mountain, but finding it on Google Maps could be difficult — they haven’t quite got the finer details of the Lake and Peninsula Borough labeled yet. Alaska is such a large state that it can be hard to show a map of it with any fine detail — the map would have to be too big. Look at the inset on this map, though, to get a sense of the general area where the Pebble Deposit is located. It’s easy to spot the 500 mile long Alaska Peninsula, which tapers off into the Aleutian Island chain. At the very base of the Peninsula, you’ll find Lake Iliamna. Cook Inlet is the large body of water to the east, and if you follow it all the way inland, along the Kenai Peninsula, you’ll get to Anchorage. 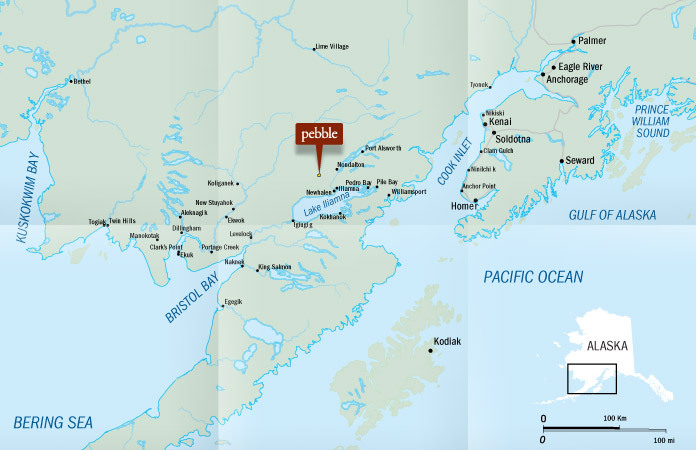 The nearest population center to the Pebble Deposit is the Athabascan village of Nondalton (2010 pop. 164), at the southern end of Six Mile Lake, and the villages of Newhalen and Iliamna (populations 190 and 109, respectively). There are no roads leading to the Pebble Deposit. For more than a decade, everything we’ve done in the area has been supported by helicopter. As you might imagine, though, using helicopters to move 80 billion pounds of copper isn’t economically viable. If our permits are approved and the mine project goes forward, part of developing the Pebble Deposit would involve building a deepwater port for ships to dock, and a transportation route to move the equipment, people and supplies to and from the mine site. The newly proposed and more condensed Transportation Corridor is comprised of a road from the mine site to a ferry landing on the north shore of Iliamna Lake, and an ice-breaking ferry across Iliamna Lake to a ferry landing on the south shore near the village of Kokhanook. The proposed road continues southeast to the Amakdedori port site on the western shore of Cook Inlet. Did you know that more than 60% of land in Alaska, or 222 million acres, are controlled by federal agencies? To put that in perspective, federal lands in Alaska account for one-third of all federal lands in the United States — larger than the state of Texas, bigger than the combination of 15 eastern states stretching from Maine to South Carolina, and larger than Oregon, California, and Washington combined.